Time for the first adventure: Zombie hunting in Chernobyl. That was a totally strange but at the same time interesting trip. Although I have to say that the price (~130€) was a bit too expensive. In addition it was obvious, that some things (e.g. dolls, school books and furniture) were arrange in a way tourist could take a nice photo. Furthermore we were told to wear a cheap white mask against radiation, but I guess it was rather to prevent us from particles of Asbestos in the buildings. Still, it was very odd standing on the rooftop, watching over a town (Pripyat), that once had 50,000 inhabitants and is being reoccupied by nature again. 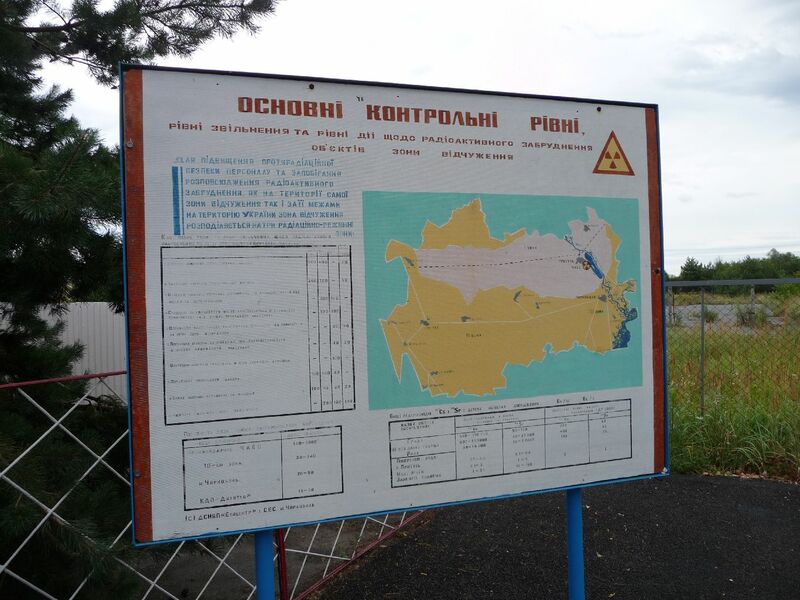 Our group passed the “famous” sights like the swimming pool, the amusement park and the hotel, before we went to reactor number 4 to take compulsory photos and measure the highest radiation (about 3,6µSv/hour, normal is 0,1µSv/hour). We were collected at 8.30 in the morning and went by bus north to Chernobyl. You could watch a film about Chernobyl or just watch the rural Ukrainian countryside. At the checkpoint we had to step out and waited a couple of minutes. Afterwards we were driven to the main sights to take photos (firemen memorial, a kindergarten, a highschool….see above). Our guide did a good job whereas the driver seemed bored and had his mobile on his ear all the time. At 1pm we went to the canteen where the scientists and other workers and of course we took their lunch. With a twinkle we were assured, that the food came from outside of Chernobyl. Due to the quality I guess nobody would’ve cared if it did had. After lunch we were allowed to go on top of one of the former apartment buildings and before going home drove to the destroyed reactor n° 4 and new sarcophagus. Nowadays people are living in the 30km security zone again, whereas in the 10km scientists and workers run around, but I couldn’t see any zombies. Why did I even want to go to Chernobyl? Well, I was fascinated by Chernobyl for a long time and after having played Call of Duty 4 and read in a newspaper, that it’s possible to book a tour, it was a location on my “where-to-go-list”. I think you might enjoy the game “SALKER : shadow of chernobyl”.